Thankfully over the past year and a bit, we have been way more conscious about what we’re shoving in our mouths! This week, i dropped in at one of my favorite stops for healthy foods, Silver Hills Bakery. I came across the Way Better Tortilla Chips…they caught my eye because our middle daughter, Melina, is a tortilla chip hound i tell you. So, i bought 3 different varieties and came home to do the taste test with the master herself! The verdict? We both loved em. They are really good! 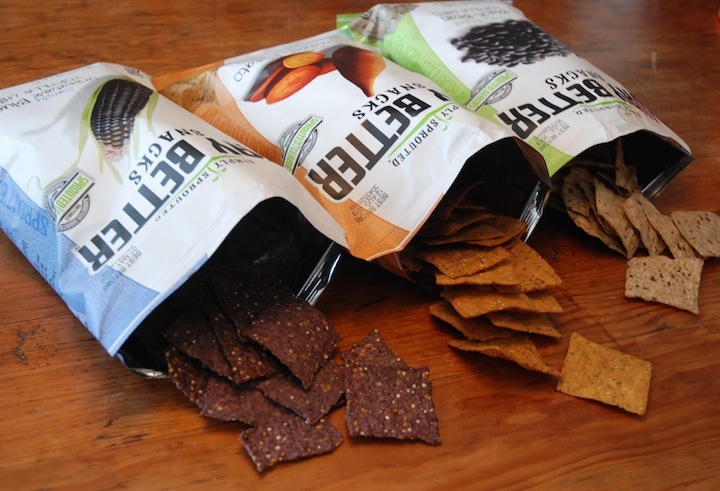 Made with sprouted grains, they are a way better choice than their nutritionally vacant counterparts: vegan, gluten free, peanut free, no artificial colours/flavors or preservatives all describe Way Better Snacks. Simply put, it’ll be hard to find a healthier chip out there (ok, i always thought healthy and chip didn’t belong in the same sentence!!) Chia seeds, quinoa, flax, diakon radishes and broccoli seeds are some of the ingredients in the different chip varieties. Not bad, hey?? This doesn’t replace eating your veggies, people, but pair the chips with some hummus or homemade salsa and you can release some of the guilt. 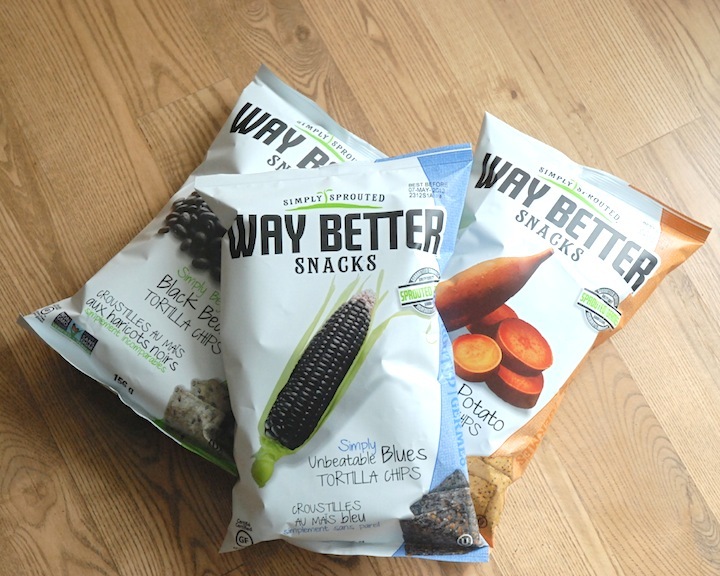 We tried the Simply Sweeet Potato, Simply Unbeatable Blues, and the Simply Beyond Black Bean Tortilla Chips. yum! The only one we missed out on was the Sweet Chili which is supposed to be a crowd favourite.. next time! Beyond packing these for my kid’s snacks, they’ll be a perfect munchie to serve to guests, too. I know i’m probably the only one who thinks that the 3 colours actually look pretty together, but hey, BONUS!! For you locals, head over to Silver Hills Bakery… And for those further away, visit your local Whole Foods, Choices Market or click here to find your nearest retailer.